Craving for pasta? Say no more! The Old Spaghetti House will be celebrating its 14th anniversary with a BANG! 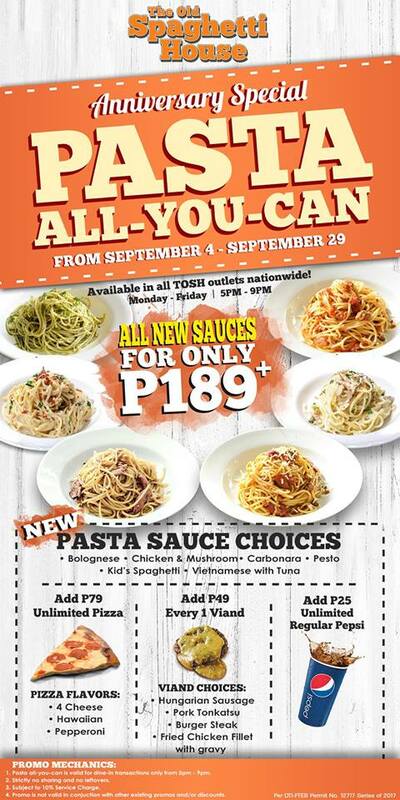 This coming September 4 until September 29, we give you, PASTA ALL-YOU-CAN! 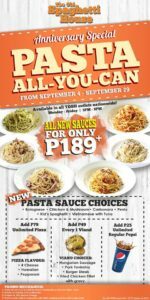 Enjoy 6 NEW different pasta dishes (• Vietnamese Garlic with Tuna • Pesto • Kid’s Spaghetti • Carbonara • Bolognese • Chicken and Mushroom) for only Php189+!!! Available in all TOSH outlets every Monday-Friday from 5PM to 9PM! YOU HEARD THAT RIGHT! ALL TOSH OUTLETS NATIONWIDE!!! So ready your tummy for another month of unlimited spaghetti goodness!